Thank you, Kathe! They were fun to create. Great job on all your projects Marsha!!! Love your 'having fun with shapes' card, Marsha. And the "zooming" butterflies, as KatheD puts it, are very playful. Great CASE of Heidi's pillow box! Thanks, Gail! It took me forever to decide what I was going to do. Love all your projects! I especially like your fun with shapes anniversary card.Love all the little details on that card. Thanks, Jeannine! I think that one was the most fun to make. Marsha, pairing the Serene Scenery DSP with the Swirly Scribbles thinlits was a terrific idea. Love the repetition of shapes and the addition of those beautiful butterflies. What a distinctly different and playful Anniversary card! Then too, pairing the Gorgeous Grunge in the second card with the butterflies continues the theme and gives those butterflies a feeling of movement. Love it! And then there is your CASE of my little pillow box. It certainly makes a great card! Love the colours (of course) and using that Floral Boutique DSP as your inspiration for the cluster of flowers. Finishing up with the pearls is just the touch of elegance they needed. Thanks, Heidi! These were all fun projects to make. I'm really liking that Serene Scenery DSP, too. Marsha what a great round of projects. 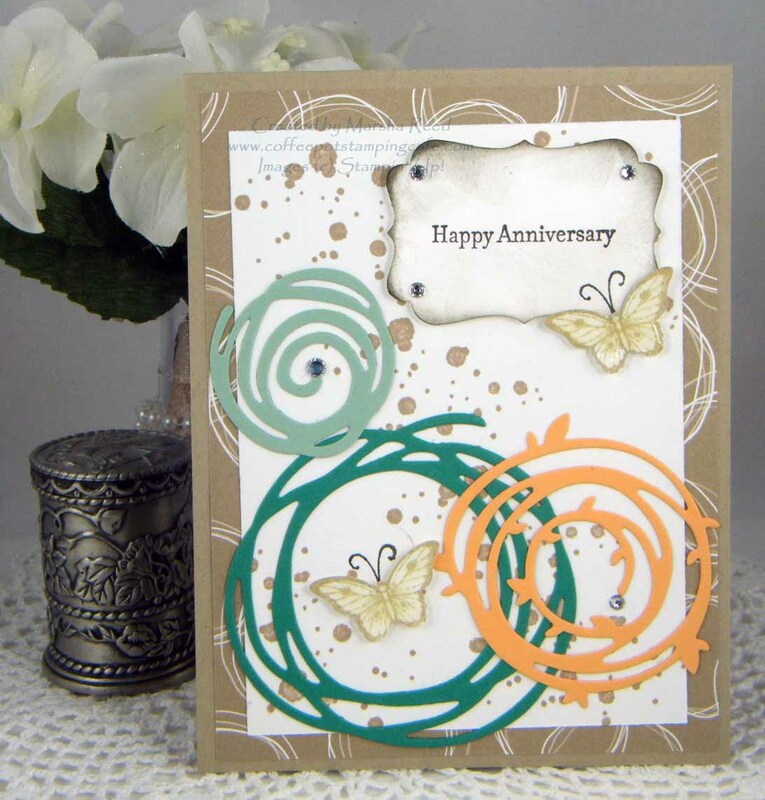 I love your special Anniversary card, with Swirly bird bits, because that's so typical of our blog hops, taking the suggested themes, going around in circles deciding how to make them our own by adding the "little bits of this and that". Love it. I love how Kathe used the term "zooming" to describe your butterfly card. It's amazing how those lines from Gorgeous Grunge add the movement to your card. Great job. 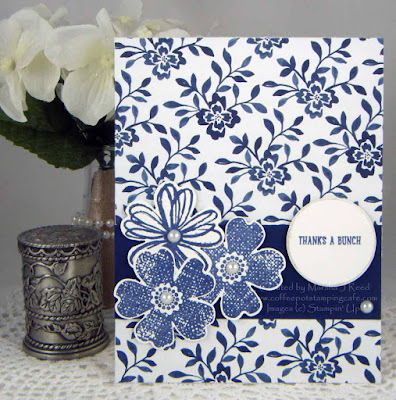 I also love how you've turned Heidi's pillow box design into such a beautiful card. Awesome! Three fabulous projects, Marsha! 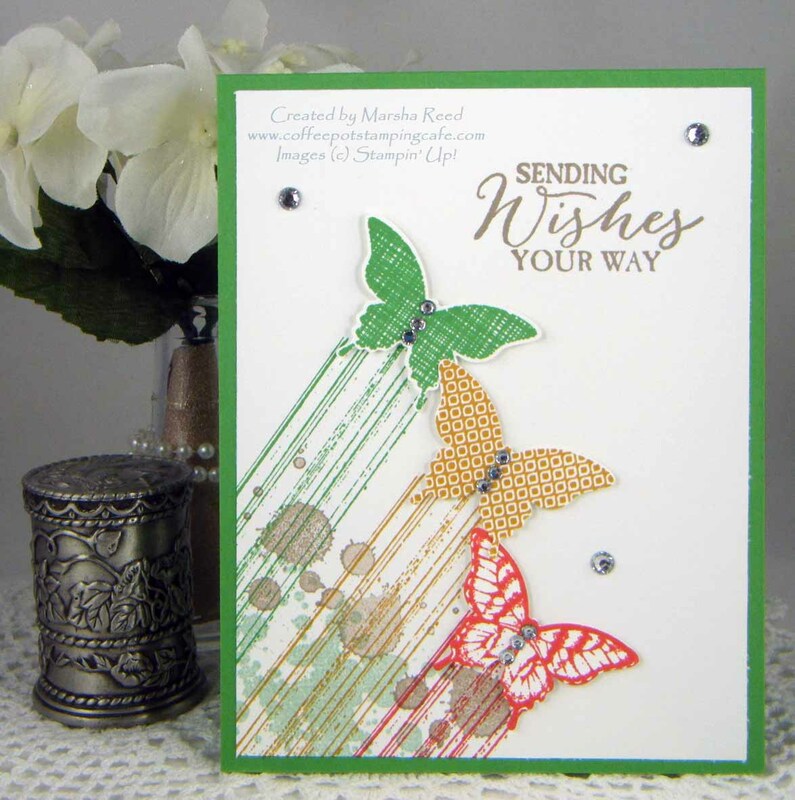 I just can't choose a favourite, because you've used all of my favourite stamp sets and colours :) I do love how those butterflies seem to be blasting off into the air on your 2nd card; they must've just come out of their cocoons! What a fun card you created when you just wanted to have fun with shapes! The use of Gorgeous Grunge reminds me of "butterfly dust" like "fairy dust" as they move through the air. I also CASEd Heidi beautiful pillow box and use the Floral Boutique Designer Series Paper - our minds were going down the same inspired track! Thanks for sharing! Thanks, Marie! I like your "butterfly dust." I'll have to remember that.